HEARING AFFECTS EVERYTHING BETWEEN YOUR EARS. If you’re like most people, you’re used to thinking of hearing as something that happens in your ears. What people often don’t think about is what happens between their ears – in the hearing part of the brain. That’s where sound becomes information that has meaning. Your brain works hard to make this happen. When the sound signals from your ears are compromised, your brain has to work even harder to fill in the gaps. This extra effort can take its toll. In fact, studies have shown that, over time, hearing loss can lead to isolation and depression. IT’S YOUR BRAIN THAT HEARS. NOT YOUR EARS. When you listen to a conversation, your ears and your brain work together as a system, with your brain doing most of the heavy lifting. Your brain is what uses the information from your two ears to orient you by figuring out which direction sound is coming from. It’s in the brain that sound waves become sounds you recognize. And your brain is what helps you focus in on a conversation and separate out unwanted noise. All four of these tasks happen simultaneously and continuously inside your brain. HOW CAN TECHNOLOGY HELP YOUR BRAIN HEAR MORE NATURALLY? With so much of your hearing happening in your brain, it’s important that your brain gets the support it needs when your hearing is compromised. 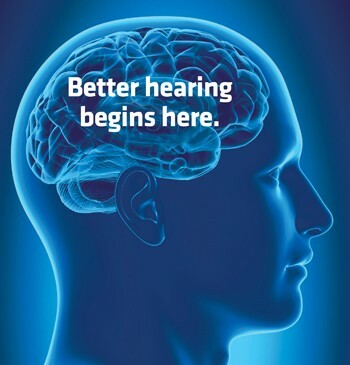 Today’s hearing device technology preserves the important details in speech, so your brain doesn’t have to fill in the gaps. Many hearing instruments today work together as a system – which reduces the effort involved to participate in conversations. What this means for you is that you will hear more naturally. Anywhere. Anytime. We’re not just about hearing aids. We’re about hearing health care! GIVE YOUR BRAIN EXACTLY WHAT IT NEEDS TO HEAR! Today’s hearing instruments are finely tuned to match your unique hearing profile and personal sound preferences. They deliver sound with the clearest, purest signal possible in the way your brain is best able to understand it. The result for you is a more natural, effortless listening experience. Anywhere. Anytime. Next Story → Men & Women: Ask yourself these questions.